I really don't know why I keep giving Lana Del Rey second chances. Because that is how it feels, at least from my point of view - ever since she won me over early with 'Video Games' I've been willing to listen to her overlong, dreary, melodramatic projects with the vague hope that somewhere she'd manage to recapture some of that magic and emotive presence. I listened through Born To Die's uneven stumbling, I suffered through Ultraviolence's insufferable baby-voiced crooning, I struggled through the more polished gleam of Honeymoon, all with the vague hope that if unable to make anything with dramatic pathos she'd at least make the melodrama compelling. Keep in mind that it's not like I couldn't find other singers in her mold that could pull off this sort of baroque pop - Julia Holter is my go-to example but take just a half-step towards folk or country or indie rock and you'll find dozens of them, many who are more compelling singers and songwriters - but I keep hoping that she'd pull it off, there's always the trace of that potential there. And believe it or not, I had hopes that Lust For Life would be the record that gets there. The lead-off single 'Love' was by far one of her best singles, and if she could deliver more tracks in that vein that could tap into sentiments that felt more fully realized or borderline populist, she could have something here. Of course, this was also a record where she was bringing many more producers on board - along with guest appearances from A$AP Rocky and Stevie Nicks and The Weeknd, which could make sense, and Playboi Carti, which absolutely did not - and it was also by far her longest record, which considering the pace and tempo would almost certainly lead to things dragging... but hey, the hope was still there, so what did I find on Lust For Life? 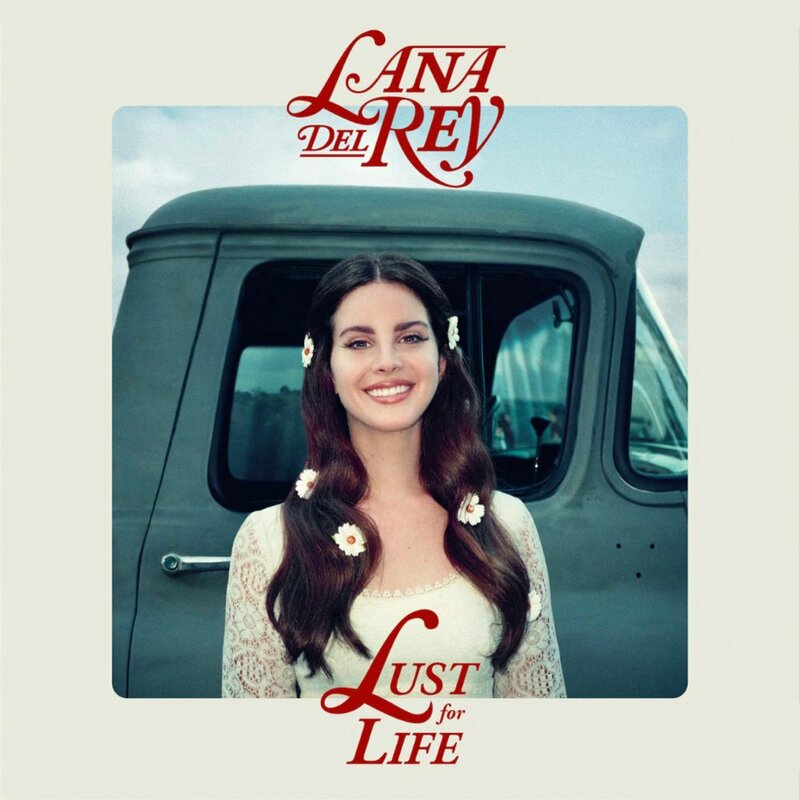 Honestly... this is one of those records that there is definitely a part of me that wants to praise - it's got some of Lana Del Rey's best songs since Born To Die, for most of this record she's sticking in a vocal register that flatters her delivery, and there are definitely signs that her writing is finally moving in the right direction. In other words, at least portions of it have much more replay value to me than anything off of Ultraviolence or Honeymoon... but at the same time, it's only pieces, because around it we have an increasingly disconnected, overlong, and occasionally insufferable set of songs that makes the album experience as a whole a lot harder to sit through. And while Lana Del Rey's projects always have felt somewhat indulgent, without the same overwrought cushion of melodrama that could occasionally save or elevate her previous work, here it just starts to test my patience. But before we get to that, let's focus on Lana Del Rey herself - and honestly, at this point you're either on-board with her semi-detached, distant, heavily multi-tracked delivery, or you're not, and for the most part, when she sticks to her lower register, there's some body to her voice and I do appreciate it. It's by no means exceptional - forget just coming out of that Nicole Atkins review, a baroque pop and soul singer who could really sing, I could rattle off a whole slew of artists who don't need nearly the same production support and sound a fair bit better - but at least she's stopped doing that baby-voiced cooing that always seemed to highlight her offkey moments or how frail her voice could get. Even a song like 'Love', which is handily one of the best of her career, still has a hook where she can't entirely carry the final lines on one breath. But hey, that sort of delivery can work with the right vocal production, like on '13 Beaches' or 'God Bless America - And All The Beautiful Women In It' or 'Heroin' - hell, 'Get Free' had some real promise to it before the overdubs came in way too loud and flat on the hook, which did nothing for the atmosphere. And then you get the question of diction... look, I actually think the writing on 'In My Feelings' is a step in the right direction, but the breathy overdubs there are a complete mess. But I think it's very telling that when you give songs for Lana Del Rey opposite Sean Lennon - the son of John and Yoko - or the legendary Stevie Nicks herself, with a voice that certainly that has carried the scars of time on it and really sells and then subverts 'Beautiful People Beautiful Problems', Lana Del Rey seems to fade in comparison, maybe just being a little starstruck. Hell, she even mentions that on the lines of 'Tomorrow Never Came', which completely shatters the verisimilitude of the song, but whatever. Well, I'll be the first to admit it's not always clear, and this does take us to a conversation about the writing on this record, where I have traditionally been one of the harshest critics of Lana Del Rey. And yet I'll say it: there are measurable improvements on this record, mostly coming through her seeming to build up some self-awareness about what might actually be good for her. I've already talked about the heady but artificial rush that actually works on 'Love', but it seems like she has finally stopped glamorizing stupid or bad relationships for the wrong reasons - it doesn't mean she's not having the relationships, but a song like 'In My Feelings' is actually framed properly this time showing how toxic and frustrating such feelings can be. And while there's always been a palpable side of self-love to Lana Del Rey's writing, '13 Beaches' is everything 'High By The Beach' wasn't, a song that plays the love-hate relationship with the press but actually goes a step deeper to show how much she actually craves the attention. 'Heroin' is another good example - for as much as the song reflects the listless haze of a bad relationship, drug abuse, a forbidding and hostile atmosphere, or maybe all three, she at least realizes by the end that she's sick of the murk. Hell, 'Get Free' might crib its main metaphor from a 2009 Alice In Chains record but a sign that she's stepping into brighter territory that does open up new doors, it's not a bad note to end the record on. But the fact that said metaphors are so plainly cribbed from other sources - be they obvious references to music or broad strokes of Americana - leads to my first problem with the writing: when you strip out the melodrama and in some cases a fair amount of the pomp and glamour, the lack of original symbolism and storytelling can make these songs feel all the more insubstantial, more iconography than narrative. Granted, that's very telling of one of the main conflicts that's always underscored so much of her best music at its core: a woman wishing to live in a rose-colored vintage past coming to slowly reconcile with the present. But it's this conflict that rises from just subtext into the text on a good chunk of this album... and man, it frustrates me to no end how so much of this is framed, or how slapdash the self-awareness feels, like opposite A$AP Rocky on 'Groupie Love', which disregards the reality of what often happened to too many young women - and to be brutally honest still happens today, in too many cases just swap the term 'groupies' for 'Instagram models' - for another submissive relationship dynamic. But that's hip-hop, and Lana Del Rey has always seemed like a woman more interested in the coolness of the genre than actually understanding its reality - where it becomes more of an issue is in the language on songs like 'When The World Was At War We Were Dancing', which frames an American collapse which they'll ignore because they're dancing just like they did the last time - which along with the old-fashioned opulence reflected in the verses shows enough privilege to avoid the real problems of the world and suffer no consequences even if America goes down in flames. After all, why else include the line for the guys 'don't try to be funny / other people might not understand' - not that said boisterous privilege is bad, but other people just won't get it. It's how you also get a song like 'God Bless America - And All The Beautiful Women In It', her big female empowerment anthem... with verses about being taken in and embraced by presumably male lovers or the final hook that changes the main line of the hook from 'women' to 'people' - so much for the big female empowerment anthem. And that's the thing: Lana Del Rey has always sounded much more comfortable living in the opulent glamour of the past, and when faced with a reality that demands engagement beyond submissive demurring, you get a song like 'Change' with lines like 'lately I've been thinking it's someone else's job to care / who am I to sympathize when no one gave a damn'... which gets even worse on the hook where she admits she'll accept the change 'maybe by the time something is done' - accept it, appropriate it, what's the difference? After all, who doesn't want to take credit for eventually being on the winning side, right? And yet, despite all of that issues... I can still freely admit this is Lana Del Rey's best record since Born to Die. It has songs I can tolerate and I still think 'Love' is one of her best. Her writing might occasionally drive me off the wall and every time she touches hip-hop it's cringe-worthy, but despite all of that and being entirely too long for its own damn good, it's got moments of quality that I do respect, and a few guest stars who actually stick the landing. It's easily her least cohesive project to date and I'd argue its issues are most visible compared to previous records, but so are its strengths, and there are more of them. As such, I'm giving this a 5/10 and really only a recommendation to Lana Del Rey fans, as I think you'll probably dig this a lot. Otherwise... it's a long record so a little hard to recommend to newcomers, but check out a few tracks if you're curious - turns out giving Lana Del Rey that next chance actually paid off a little this time around.